‘Elicitors’ for a plant refers to chemicals from various sources that can trigger physiological and morphological responses and phytoalexin accumulation. Elicitation is the induced or enhanced biosynthesis of metabolites due to addition of trace amounts of elicitors. As quercetin is considered as a bioactive ingredient of Citrullus colocynthis. Present study was carried out to examine the effect of phenylalanine on production of quercetin in liquid cultures. Exogenous incorporation of b-phenylalanine in liquid culture increased the yield of total quercetin about 2 to 3 fold in comparison to control (control = 3.05 mg/g dw; fed = 7.25 mg/g dw). Fig. 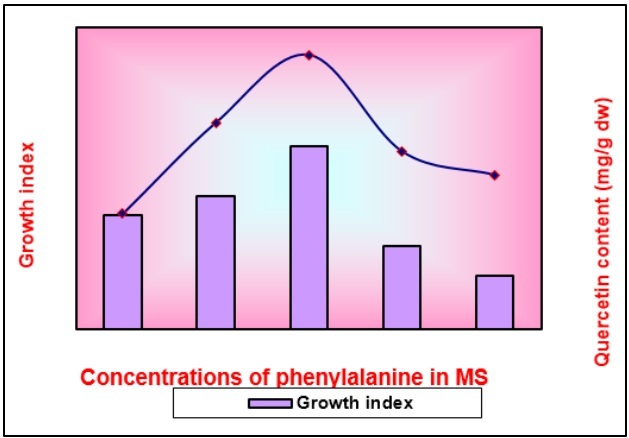 : Effect of phenylalanine on growth indices and production of quercetin in 6 weeks old tissue. Mahesh Chand Meena*, Rishi Kesh Meena, Vidya Patni. Effect of elicitor on quercetin production in cell cultures of Citrullus colocynthis (Linn.) Schrad. 2014; 3(2): 18-23.